Jacksonville rallies in front of city hall on National Day of Action Against Police crimes | Fight Back! 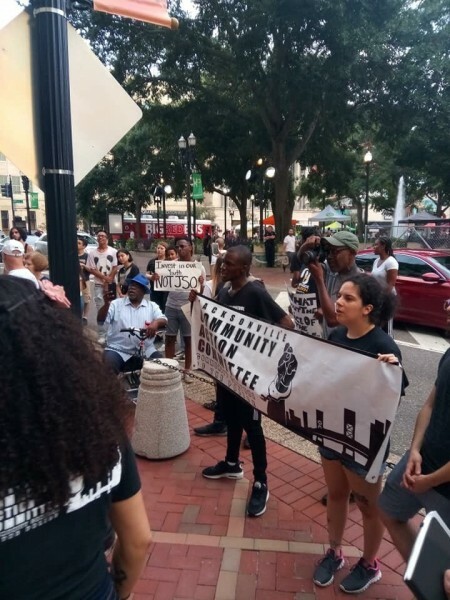 Jacksonville, FL - On Sept. 5, over 50 people in Jacksonville rallied outside of city hall for the National Day of Action against Police Crimes. The event, organized by the Jacksonville Community Action Committee (JCAC) featured speakers from various local community organizations, including the Jacksonville Palestine Solidarity Network, the Black Commission, the Northside Coalition, the Jacksonville Progressive Coalition, and UNF Students for a Democratic Society. Protesters stood in solidarity with the demands coming out of Chicago for community control of the police; to convict killer Chicago Police Department cop Jason Van Dyke as well as for Justice for LaQuan McDonald. Sept. 5 was the first day of the Van Dyke trial for his 2014 slaying of McDonald, which caused a national uproar once dash cam videos were released. Event emcees Michael Sampson and Christina Kittle drew the parallel of what’s happening in Chicago to why we need community control of the police here in Jacksonville. Protesters also spoke out about the proposed city budget by Mayor Lenny Curry and Sheriff Mike Williams that would give JSO even more money and cops on the street, all the while infrastructure in the city’s Black areas of town are crumbling. The Jacksonville Community Action Committee vowed to keep fighting for community control of the police in Jacksonville.